This fish is a protandrous hermaphrodite, all fish begin life as male, and can turn into a female if there are not enough females present. Can only change once mature at around 5 years old. This fish will eat any other that can at least half fit in it's mouth, known to eat fish larger than itself. Best kept in a species tank, or in a large tank with larger fish. Regularly trained to take commercial foods, farmed commercially using high protein pellets. Wild diet consists of insects, worms then smaller fish including other smaller Barramundi as they get bigger. Feed once or twice a day, this fish has a voracious appetite. Inhabits fresh and estuarine water bodies in northern Australia. 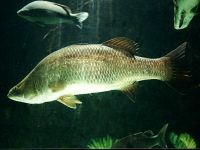 Does not require salt water to breed however, and best kept in freshwater in captivity. Needs temperatures above 20°C (68°F) ideally 26°C (78.8°F) . Excellent filtration is essential. Ruthless killer of other fish with an evil look about it as it stalks its prey. Hardy and fast growing, can be grown from fingerling to plate size eating fish within 9 months. Excellent hunting abilities, will mimic other fish to join a school before eliminating its new friends. A large silver (when young) or olive-green (when mature) fish, with yellow hints to the fins and with a heavy-set body and pointed head. Develops a large humped back as it matures. Other colour variations have been seen.